THE film Chak De lifted the morale of the entire country, putting the lilting motto on countless lips, and inspiring a billion dreams about great sporting triumphs. But the biggest dream was about a grand revival in our national sport, hockey, and that has come crashing down with Britain trouncing India 2-0 in the Olympics qualifying round at Santiago. It was a couple of years ago that we failed to make it to the semi-finals of the Asian Games. THE decision of the PPP and the PML (N) to form a coalition government in Pakistan is a welcome development. This is exactly what the voters wanted when they exercised their franchise on February 18. The people gave their mandate to the two parties to work together for the realisation of their democratic aspirations. THE chief ministers of Punjab and Himachal Pradesh deserve to be congratulated on coming forward to resolve ticklish inter-state issues. This has become possible due to the BJP, which is a coalition partner in Punjab, assuming power in Himachal Pradesh. Earlier, the Congress governments in the two states, as also in Haryana, could not rise above their differences and forge regional cooperation. IN many respects, Malaysia is a success story, with its moderate brand of politics and a Tiger economy hospitable to foreign investment. It was indeed cited as a role model for a modern Islamic nation-state. It was built on an overarching National Front, which co-opted sections of its two main minorities — ethnic Chinese and Indians — in a Malay-dominated political structure. MY Indo-American nephew’s three-year-old daughter Asha of mixed parentage (an Indo-American father and a French mother) came visiting India along with her parents this winter. As for Asha and Sylvie, it was their first visit and even my nephew had come after a good 15 years. A recent controversy on the battle of Longewala is wholly unnecessary and detracts from the reality of that iconic event. Every battle can be perceived from different perspectives. Individual claims on such events are more prone to misinterpretations. BACK in the spring of 1968, East African Asians were adjusting to the retreat of colonialism. We were, remember, the essential middle-class buffer between whites and blacks, set up to service the empire. NOW that Punjab chief minister Parkash Singh Badal has formally crowned his son and heir-apparent Sukhbir as the Akali Dal president, politcal pundits are wondering if the father will vacate the CM’s kursi for his son. THE film Chak De lifted the morale of the entire country, putting the lilting motto on countless lips, and inspiring a billion dreams about great sporting triumphs. But the biggest dream was about a grand revival in our national sport, hockey, and that has come crashing down with Britain trouncing India 2-0 in the Olympics qualifying round at Santiago. It was a couple of years ago that we failed to make it to the semi-finals of the Asian Games. While India’s hockey fortunes have clearly been on the downswing in recent times, we have now hit a new low. It is for the first time since our debut in 1928 that we, who have been eight-time champions, have failed to even qualify. The British players showed a lot verve and determination in thwarting the efforts of the Indian forwards, while making good on early chances. India failed to make a dent even with as many as five penalty corners. 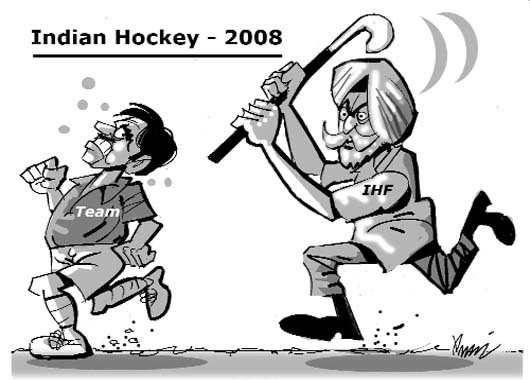 While Indian Hockey Federation (IHF) head honcho K.P.S. Gill facilely blames the players for the debacle, he and the federation have a lot to answer for in the way it has administered the game, and for its failure to find, nurture and manage talent. There have been many controversies and hare-brained ideas like monetarily penalising players for conceding goals, and the like. It is also a widely acknowledged fact that the bossism in sporting bodies does more harm than good, and such positions are exploited for their connections, prestige and privilege, rather than for promoting the cause of the game. Even the International Hockey Federation is worried about the decline in a premier hockey playing country like India, and their concern has extended to funding coaching and training activities. The Indian federation, however, does not see eye to eye with many initiatives. The Sports Authority of India roped in Australian hockey legend Richard Charlesworth to coach the Indian team and assist in selection and general training, and is even part-funding the costs. But the IHF has kept him at arm’s length and he is in Santiago only as an observer. Clearly, it is the game’s interests that are last in the minds of administrators. The team’s ousting has come as a shock to all fans and the numerous Olympians in the region. It is a sad day, indeed. THE decision of the PPP and the PML (N) to form a coalition government in Pakistan is a welcome development. This is exactly what the voters wanted when they exercised their franchise on February 18. The people gave their mandate to the two parties to work together for the realisation of their democratic aspirations. Going against the people’s wishes would have cost these parties dear. There were reports of a section of the PPP’s National Assembly members talking of deserting the party when they got the hint of something cooking between PPP leader Asif Ali Zardari and President Pervez Musharraf soon after the poll outcome was known. This must have had a bearing on the thinking of Mr Zardari, who, after initial reluctance, has accepted PML (N) leader Nawaz Sharif’s demand for the reinstatement of the dismissed judges, including Supreme Court Chief Justice Iftikhar Mohammad Chaudhry. The judges issue indeed was a sticking point which has been sorted out. Mr Nawaz Sharif’s party had contested the elections with this issue as its main plank. He could not ignore the cause of bringing the judiciary back to the position that existed before November 3, 2007, when President Musharraf imposed an emergency and replaced the uncooperative judges with those ready to endorse his controversial re-election and emergency edits. Mr Sharif has only slightly relented from his earlier stand that the status quo ante must be restored immediately after a new government is installed. The latest agreement between him and Mr Zardari has it that this will be done through a resolution of parliament (National Assembly) within a month of government formation. The power-sharing arrangement between the two major parties, if it lasts, can provide strength to the new government. Political parties’ coming together does not suit President Musharraf. It will be interesting to see how he reacts to the emerging scenario. His continuance in the position he occupies may not be possible once the dismissed judges are back to their respective courts provided there is no undeclared deal between him and Mr Zardari. There is the possibility of the former Army Chief using the dreaded provision in the Pakistan constitution, Article 58 (2) (b), to dissolve the National Assembly if there is a confrontation between him and the coalition government. That will be the saddest day for those aspiring for real democracy in Pakistan. This could undo whatever the people have achieved through the elections. THE chief ministers of Punjab and Himachal Pradesh deserve to be congratulated on coming forward to resolve ticklish inter-state issues. This has become possible due to the BJP, which is a coalition partner in Punjab, assuming power in Himachal Pradesh. Earlier, the Congress governments in the two states, as also in Haryana, could not rise above their differences and forge regional cooperation. In fact, the Central grant of tax concessions to the hill state had exacerbated its relations with the other two states, which, claiming the loss of new industrial projects, pressed the Centre to withdraw the tax holiday. This had annoyed the previous Chief Minister, Mr Virbhadra Singh, so much that he had publicly ruled out any cooperation with the two neighbouring states. Mr Parkash Singh Badal and Mr Prem Kumar Dhumal have signed agreements under which the two states will share power during their peak periods and Punjab will complete the much-delayed direct road to Baddi from Siswan. When completed, this road would cut short the travel time and vehicles from Punjab would not have to enter Chandigarh to reach Baddi. The demand for power is at its peak in Punjab in summer while it is in winter that Himachal needs more power than it produces. Both stand to benefit. Under another pact, a ropeway will link Nainadevi to Anandpur Sahib and this will help pilgrims. There are some irritants which still need to be removed. These include the Punjab control over the Shannon powerhouse, which is located in Himachal. Himachal also wants a share from the Bhakra-Beas project. All such pending issues can be resolved in a spirit of give and take with regional cooperation and mutual benefit as the overriding considerations. The two states can move further and take up joint hydroelectric projects. While there is enough goodwill now, there may not be sufficient cash with the Punjab government to undertake new such projects. That is a pity. In the early sixties, not long after Malaysia had gained independence from Britain in 1957, during my years in the region it was presided over by the benign figure of Tengku Abdul Rahman who liked his golf and brandy ginger. The Tengku is now revered as the father of the nation and a museum in Kuala Lumpur lovingly preserves his mementoes, including his splendid old car. But Malaysia has not always been quiet. Race riots between ethnic Malays and Chinese in 1969 were bitter and a warning of the importance of good race relations. One lesson Malaysia’s ruling elite learned was the need for affirmative action for the Malays, now 60 per cent in a population of 28 million, with the Chinese at 25 per cent and Indians at 8 per cent. Malays, characterised as bhumiputras, were given preference in university admissions and government jobs, got discounted homes and had a mandatory 30 per cent quota in all publicly listed companies. The Chinese were the traditionally rich class and could enjoy their wealth as long as they accepted the primacy of Malay political power. Many Indians, on the other hand, were at the bottom of the pile, 85 per cent of them being descendants of indentured labour brought to Malaya by the British for the rubber plantations. Decades of resentment of the Indian community finally burst last November in the form of a rally of several thousand people under the rubric of Hindraf (Hindu Rights Action Force), which was broken up by the police, who made several arrests. Fast track now to last Saturday’s general election called by Prime Minister Abdullah Ahmad Badawi in which the ruling National Front put in its worst showing since it came to power. It lost its traditional two-thirds majority and, in addition to the Kalantan state retained by PAS, the conservative Muslim Malay party, lost Selangor, Perak, Kedah and Penang states. It got 139 seats out of 222. The opposition secured 82 seats against the 19 it held in the last Parliament, more than 30 of them bagged by the People’s Justice Party of former Deputy Prime Minister Anwar Ibrahim, who was jailed by his boss, the dynamic, pungent and long-serving Mahathir Mohamad, on charges with a pronounced political tinge. In an instance being viewed by the ethnic Indian community as poetic justice, S. Samy Vellu, head of the Malaysian Indian Congress of the National Front and Works Minister, lost his seat and one of the detained Hindraf leaders, M. Manoharan, won a seat under the aegis of a multi-racial alliance. No wonder, a Malaysian tabloid described the election result as a “political tsunami”, Mr Ibrahim calling it “a defining moment unprecedented in our nation’s history”. Mr Badawi has asserted that he will not resign, despite the results and calls from Mr Mahathir, among others. One Hindraf member, P. Waythamurthy, had fled to India after the government’s crackdown on the organisation’s rally and blotted his copybook by seeking the support of the Tamil Nadu Chief Minister, Mr K. Karunanidhi, and Bharatiya Janata Party leaders. At the same time, he made intemperate statements about Sri Lanka’s fate awaiting Malaysia if it did not mend its ways. It was too good a cue for Kuala Lumpur to miss, with elements of Hindraf being painted with the Tamil Tigers brush. In a sense, the results of the election should be welcomed, whatever the underlying ethnic tensions. Together with forward-looking economic policies, Malaysia’s form of democracy was of a paternalistic and somewhat feudal variety, with the Malay-dominated National Front enjoying overwhelming power, the only real political challenge coming from the conservative Malays PAS party. Malays, it was recognised by all, were a more equal component of the nation. But political concessions granted to one section of a country’s population, as India has discovered to its cost, become permanent features of a political system. In Malaysia’s case, the bulk of the ethnic Indian population felt more disadvantaged than the pampered Malays and saw no prospect of advancement even as the rubber plantations gave way to palm oil and urbanisation even deprived them of their homes. Perhaps the demolition of some temples by municipal authorities that declared them illegal was the proverbial last straw that broke the camel’s back. Malaysia’s new Parliament will certainly be a livelier affair than its predecessor. Malaysia now has the nucleus of a significant opposition, but it remains to be seen how the leadership of the United Malays National Organisation, the top of the National Front, guides its followers on living with the new reality. It will not be easy for many Malays, who took their political dominance as a natural right and did not feel they were accountable to anyone else. Mr Badawi himself might have to go, despite his protestations, because the “tsunami” happened on his watch. But the personality factor is less important than UMNO’s future policy and reorientation. Opposition victories by a coalition of three parties in several states will change the traditional outlook of how the country has been governed. To begin with, it will increase Chinese and Indian sense of empowerment beyond the token role of the government through their sarkari parties. The future will depend in a large measure on how the dominant Malay majority takes the huge setback to its traditional party of power. In other words, are they more willing to share power with fellow citizens of other ethnic background now that many of them have become more prosperous and achieved a majority status with a rapid population growth? Mr Badawi has acquired the reputation of being a rather indolent leader, but UMNO can throw up other leaders who have more of the dynamism and leadership qualities of Mr Mahathir Mohamad. MY Indo-American nephew’s three-year-old daughter Asha of mixed parentage (an Indo-American father and a French mother) came visiting India along with her parents this winter. As for Asha and Sylvie, it was their first visit and even my nephew had come after a good 15 years. Perhaps, this was courtesy Sylvie, his French wife who, like Madonna, Cherrie Blair or Elizabeth Hurley, had always nurtured a secret desire to visit India, a country of everybody’s dreams, as far as diverse ethnicity or the inimitable Taj Mahal is concerned. It so happened that my daily routine of starting the day with a Dainik Havan aroused little Asha’s curiosity no end. An early riser to the core, she watched me perform the ritual with bewildering but incredulous eyes the first morning itself after her jetlag was over. I, however, attributed it to the natural inquisitiveness of a child and merely smiled at her. Come the next morning and I found the tiny “elf-like” Asha sitting outside my bedroom at seven o’clock in the morning. Undeterred by the wintry cold, the chilly floor or her sleeping parents, the little one was waiting patiently for me to begin my “havan”. A chance opening of my door suddenly made me aware of her presence and I picked her up in my lap to find out the purpose of her eavesdropping. “I want to light the fire as you do, mamiji (as I am referred to by her doting parents) and say those words with you...and put something in the black pot,” referring to the havankund of course, I knew for sure. “Yes, yes, of course, my darling, come and sit with me. I’ll teach you,” said I, greatly elated and amazed. And thus started a pleasant morning routine for me and my adorable little Asha when, like a dutiful disciple she would sit opposite me with the havankund between us. As I would chant the Vedic-mantras with a practiced ease, she would try to follow with a keen gaze and an equally sharp memory. The sporadic offering of samidha or samagri greatly added to her enchantment with the ritual. A week of her stay with us and her unflinching regularity and single-minded devotion prompted her to remember and recite “Om bhur bhuva swah...” with childlike wonder and a delightful stammering lisp. Their short sojourn would put an end to this “kid-fantasy” as soon as she would be back in the land of Columbus, I thought wistfully. But little Asha seemed to be made of a different mettle. Once there, not only did she continue remembering the initial words of the mantra “Om bhur bhuva swah....” but she would also insist that all the family members fold their hands, close their eyes and recite the mantra after her at least five times before the meal-times. Her incessant coaxing with her “granny” to “treat” her with a havan every time she visited her has almost forced my sister-in-law to look for a havankund and learn the complex and tedious recital of the “Vedic-mantras”. This is not to mention the innocent insistence of the child asking her dadi to tell her the story of the “guy with a pony-tail” and the “shame-shame” boy on looking at the picture-calendars of Chanakya and Swami Dayanand at my house enunciating boisterous laughter from all of us. The poor dadi, put in a tight spot, searches the internet or the religious people so that she could comply with the wishes of her grandchild. I have been wondering if little Asha is an oriental spirit having taken rebirth in the land of opportunities. To me, she combines our own strong oriental charm with the western curiosity. The correct and factual record of a battle is therefore, always, based on accounts of those who fought in it, and those who planned and conducted it. Gallantry awards are awarded after the action is corroborated by a number of eye witnesses. It is therefore helpful to analyse the reality of the battle to separate facts from fiction. This is particularly relevant since the movie ‘Border’ based on the battle had captured the public imagination. Movies of necessity dramatise the action. The director of the film cannot be blamed for using artistic license to increase its market value. Those who fought the gallant action cannot likewise be blamed for the way the film portrays them. In real life, they are all modest human beings unrecognisable from any other citizen. Those who really fought speak the least of it. The battle was a classic example of a joint effort by the army and air wings in destroying a bold armoured thrust by Pakistan. The Indian Air Force would not have had a concentration of tanks to destroy, if the small and outnumbered army position had not stood its ground and stopped the armoured thrust. Pakistani tanks would have made a deep thrust into our territory if they had not been stopped that night. The army position would have been overrun, if the air attack had not come when it did early the next morning. The army pilot, in an unarmed small aircraft, made a significant impact by first directing artillery fire and then guiding the Hunters of the air force on to the Pakistani tanks. In classical military terminology it was the army’s anvil on which the hammer of the air force destroyed the enemy thrust. Both were needed and combined superbly to bring about an outcome which is rated as a classic battle. It is pertinent to mention what the Pakistani experts had to say of this battle. Brig (Retd) Zaheer Alam Khan commanded a tank regiment in the sector. He is one of nine brothers who served in the Pakistani defence forces, with one brother rising to become Chief of Joint Staff. His is a graphic account of the confusion and chaos that prevailed because of not assessing the terrain correctly and of the shock when the Indian group fired back on the leading column. Unable to move off the single track which was being denied by Major Chandpuri’s men, they remained bunched up and offered themselves for destruction by the Indian Hunters in the morning. No wonder Longewala is referred to by some Pakistan analysts as their biggest tank disaster in that war. The questions which need to be asked are, who would have kept the Indian chain of command informed of where the action was, of the seriousness of the threat, and the nature of targets that were available, if not from Longewala? Whose interest was being served, in falsifying the depiction of battl ein a war that had been won? It would be grossly unfair to claim that the entire chain of command from Company to Division and above up to the redoubtable Sam Manekshaw was party to it. The air force itself won eight Vir Chakras in this action. Air Chief Marshal Lal in his book, My Years in the Air Force refers to the critical role played by the outnumbered but brave group which held their ground at Longewala, and refers by name to their commander. It is therefore a travesty to interpret this fine battle as an achievement of one service or group or even an individual. That is what modern war is all about. Unless it is fought jointly without regard to the glory of one individual or group, it will be lost. That is what happened on the Pakistani side, where personal rivalries and professional egos made a mess of the little chance of success which might have existed. It is time to reflect on the nature of military battles in the age of modern technology. Battles can go wrong within the hour by a wrong decision by the man on ground, or, by a commander in his map room. While the best results are obtained by combined action, the best plan can sometimes be defeated by one weak link in the chain. When it all works well a wise leader thanks fortuitous circumstance, instead of casting aspersions. Field Marshal Slim, who was a legendary commander, wrote of his reconquest of Burma as an outcome of many nationalities and forces fighting together, which fortunately proved good enough to obtain victory. Let us be modest in victory and be thankful for the efforts by the soldiers and airmen who won us the battle of Longewala. BACK in the spring of 1968, East African Asians were adjusting to the retreat of colonialism. We were, remember, the essential middle-class buffer between whites and blacks, set up to service the empire. East African political leaders were “blackenising” the civil service and other institutions. Asians, born and bred there, found themselves jobless and hopeless. Those with British passports made arrangements to move to their motherland, a move never imagined by those who handed them citizenship – an act of post-imperial vanity. About 13,000 Kenyan Asians entered the UK to be met by media hysteria to keep back the incoming tides of bituminous “filth”. The loyal immigrants were stunned. The MPs Enoch Powell and Duncan Sandys launched a vicious campaign against non-white immigrants through the early months of 1968. Class snobs both, they became the gentlemen heroes of butchers, bakers and candlestick-makers. Hating the foreigner was easier than hating the toffs who had kept them down. To curb the racist swell, on 1 March, the Government rushed through an immigration law, described by Auberon Waugh as “one of the most immoral pieces of legislation ever to emerge from any British parliament”. Only those with a parent or grandparent born in Britain were thereafter entitled to freely enter. As Professor Zig Layton Henry wrote in his seminal book on race and politics: “The supporters of immigration controls knew they had the upper hand and they could dictate the political agenda. The temptation to escalate the issue proved irresistible.” Powell made his apocalyptic blood and damnation speech the very next month. Forty years on exactly, I am filled with foreboding as I witness my country giving way again to those contemptible instincts of 1968. Decent Britons collectively fought against Powellian dystopia, tried to forge a nation where various histories and claims would be contested without malice, where race and class, though strong imperatives, would give way to equality and shared humanity. And, in many ways, we did achieve these goals. Britain opened up to difference, most of all at the level of pleasure – food, design, architecture, humour – and intimacy between friends and lovers. Those who came found freedoms and democracy. Other Europeans marvel at this ease of mutual adaptation. Yet today the air smells of the bad breath of xenophobia and racist bile, on buses, Tubes, radio programmes and the internet, of course. Worse, these attitudes are now considered a valuable democratic indicator – evidence that “alien” immigrants are a disaster for the nation. Intellectuals and the media now treat bigotry with deep respect. Obsessive research into the “dangerous” Muslim men goes on and on and immigrants get trashed daily. Last week John Humphrys repeatedly mugged Liam Byrne, the Immigration minister, with the question: “Are there too many immigrants in this country, yes or no?” Does he seriously think there is such an answer or was he trying to whip up populist anxiety? Outlandish claims enter the nation’s consciousness without challenge. Take the recent Royal United Services Institute report, which reads like the fantasies of a crazed, paranoid mind. Terrorism is caused by “multiculturalism” and the leadership should “lay down the line to immigrant communities”. National identity and welfare state debates are manipulated by influential people to validate the rise of racial resentment against us. When we complain, they say we don’t understand, misrepresent their sophisticated arguments. Small brains, I guess. These petty patriots and narrow nationalists have successfully rebranded Powellism and made it cool, cool enough for New Labour, which of course, again surrenders its foundational principles. It is our fault too. Muslim politics have savagely wounded the anti-racist alliance. Inter-ethnic culture wars leave us no energy to confront the bigger problems together as we once did. The bombers in London blew up our hopes as well as the nation’s optimism. They enable the new racism to feel good about itself. NOW that Punjab chief minister Parkash Singh Badal has formally crowned his son and heir-apparent Sukhbir as the Akali Dal president, politcal pundits are wondering if the father will vacate the CM’s kursi for his son. The grapevine has it that Sukbhir’s mother Surinder Kaur, who was his most ardent supporter and had lobbied hard for him with Badal senior, has backed off. Apparently miffed over Badal junior’s wife’s recently-acquired political ambitions, she has done a complete U-turn and is now pressing her husband not to step down. The young couple, she fears, will isolate the in-laws if the son is handed over the reins of the state. How is that for a real saas-bahu saga. With a large number of Rajya Sabha members due to retire early next month, all the political parties are currently witnessing a mad scramble for a berth in the Upper House. In Haryana, for instance, the Congress has two seats but the list of contenders is at least a mile-long. Among those who are lobbying for a ticket surprisingly include two ministers from the Haryana government – Birendra Singh and Kiran Chaudhary, who want to escape from the state because of their strained relations with chief minister Bhupinder Singh Hooda. But they might eventually be stumped by Hooda, who, it is learnt, is doing the rounds in the Capital to get his wife Asha into the Upper House. A recent visit to a Rajasthan town revealed how the Censor Board’s decisions do not filter down and are not implemented in full. A few weeks ago, the board had ordered the deletion of a few lines from a song from the latest Madhuri Dixit starrer “Aaja Nachle,” after a community protested that it contained derogatory references to them. The lines were deleted from the song put out in bigger cities like Delhi and Mumbai but apparently not in smaller cities. The original song with the offensive lines intact is also being played on FM radio stations in these cities. So much for the sanctity of the Censor Board. Justice H. R. Khanna may have been deprived of the post of Chief Justice of India for his bold stand on protection of citizen’s rights during the Emergency, but in the words of Attorney General Milon Baneji, this single act of his made him an icon of the Indian judiciary and one of the greatest judges to adorn a seat in the Supreme Court. Justice Khanna will be remmbered for his contribution to the evolution of the theory of ‘basic structure’ of the Constitution, which was discussed in detail by him in the historic Keshvanand Bharti case verdict, as his views were clearly ‘distinct’ from the other judges on the 13-member bench. In fact, these proved path breaking as a nine-judge bench in an order last year emphatically endorsed Justice Khanna’s views that the basic structure of the Constitution cannot be tampered with.